If you find yourself suffering from a leaky roof whenever it rains and are struggling to resolve it, it’s likely that your existing felt or asphalt roof isn’t up to the task no longer. 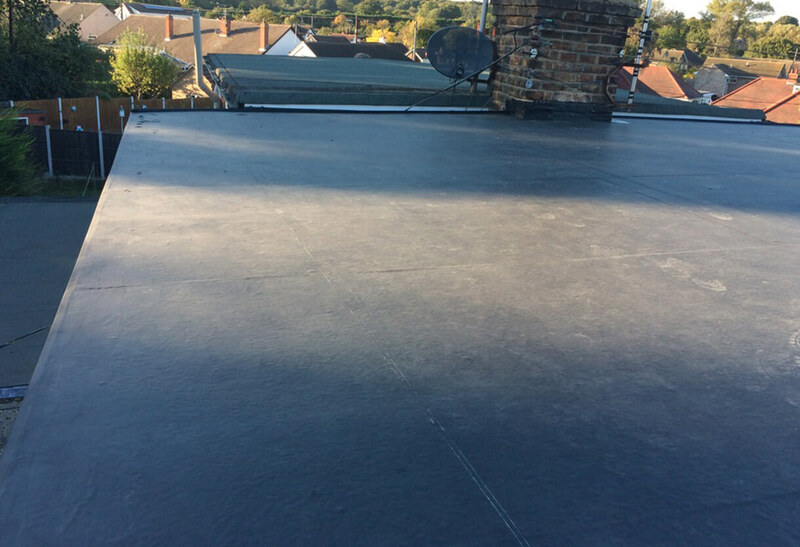 Thankfully, the team here at Double Glazing Essex Ltd are proud to offer homeowners flat roof replacements engineered in rubber, or more specifically EPDM (ethylene propylene diene monomer). It’s the modern solution for new and old properties that want to stay protected from the harsh weather for years to come. Our team fit rubber roof replacements in airtight fashion, removing the chance of holes or rips ever appearing. One of the advantages to a design like this is that heat will be trapped more successfully, not being able to escape once warmth rises as it often does. Once fitted, you’ll always be able to stay comfortable and insulated – especially when combined with thermally efficient windows and doors. Rubber roofing from Double Glazing Essex Ltd is far less prone to leaks thanks to their advanced membrane construction. The same unfortunately can’t be said for properties still making use of a felt roof, which hold no candle to EPDM extremely long lifespan of around 40 years. Even in the rare chance of damage, repair and modifications can be accomplished with ease and with the expectation of long term performance, unlike other roofing systems that degrade or become brittle over time due to UV exposure. Our rubber roofs are exclusively available in a black colour. This helps the sustainable system to look natural, never showing dirt, and means it can suit all styles of home. They do not support the growth of moss unlike most rival felt flat roofs – no stone chippings or solar reflective paint required! A nice, smooth, clean finish is always guaranteed. Longer lifespan than an asphalt roof means a reduced carbon footprint. Quickly installed onto any existing felt flat roof. Roof replacements engineered in EPDM are actually nothing new, having stayed consistently strong and defensive in homes that had them fitted during the 1970s. Compared to felt and asphalt flat roofs, however, rubber has a far easier time at fending off the harsh rain and winds British homes are forced to withstand, providing excellent thermal properties and protection against water penetration. Cost effective and quick & straightforward to install, our team of experts have installed many of these proactive rubber roofs across Essex over the years. Drastically overhauling the efficiency of your roof, rubber roofs can boost property aesthetics too, similar to our range of Roofline improvements.